We all want to read more. If reading older books is exponentially more beneficial for acquiring knowledge than reading newer things, then reading the great books is a good place to start. These books build the foundation of knowledge. One of the best places to find a list of the great books is St. John’s College in Annapolis, Maryland. The interdisciplinary curriculum focuses on the foundational works of philosophy, literature, history, political science, theology, economics, music, mathematics, and the laboratory sciences. Sounds like the type of education I didn’t get in school and I’m making up for now. At St. John’s, all classes are conducted seminar-style. By engaging in these small seminar classes, students learn skills of critical analysis and cooperative inquiry. Students also refine their ability to think, write, and speak across all disciplines by writing substantial annual essays and defending them in oral examinations. Many consider the curriculum an outrage. I wish it were more common. no tests. No grades, unless you asked to see them. No textbooks—I was confused. In place of an astronomy manual, you would read Copernicus. No books about Aristotle, just Aristotle. Like, you would read book-books. The Great Books, so called, though I had never heard of most of them. It was akin to taking holy orders, but the school—St. John’s College—had been secular for three hundred years. In place of praying, you read. I’m going to post the list in the order students encounter them: freshman, sophomore, junior and senior. 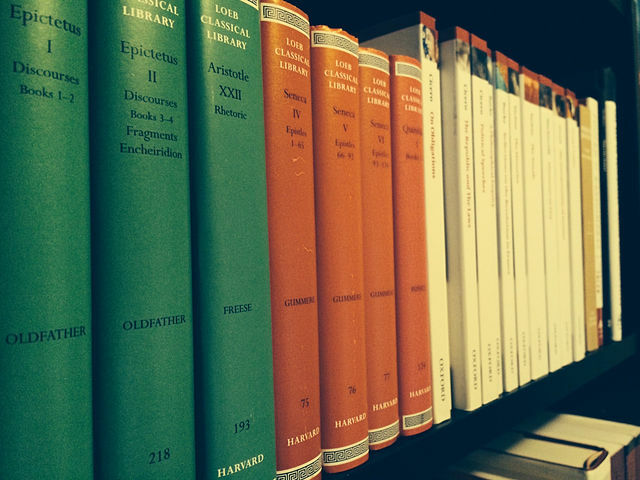 The first year is devoted to Greek authors and their pioneering understanding of the liberal arts; the second year contains books from the Roman, medieval, and Renaissance periods; the third year has books of the 17th and 18th centuries, most of which were written in modern languages; the fourth year brings the reading into the 19th and 20th centuries. So here’s the deal. Pick a few books and start pecking away.